Universal Studios Monsters: Werewolf of London action figure by Sideshow Toy (2000) | 'TAIN'T THE MEAT… IT'S THE HUMANITY! Werwolf of London told the story of botanist Dr. Glendon, played by Henry Hull, who is bitten by a werewolf while on a research trip to Tibet. Upon returning to London Glendon turns into a werewolf at the next full moon and begins to terrorise the city. Only a rare plant, the Tibetan Marifasa Lumina Lupina (which only blooms in the light of a full moon) can slow his decent into lycanthropy, and Glendon spends most of the film trying the get the bloody thing to flower. Sadly the film doesn’t end well for the good doctor, who is gunned down before he can kill again, or find a cure. Although Werewolf of London wasn’t a success for Universal the film did go on to have have an impact on popular culture. The film has inspired at least two pop songs: one by psychedelic rocker Paul Roland and, more famously, Werewolves of London by Warren Zevon, which was a huge hit in 1978. And a video game based on the film was released in 1987 on the ZX Spectrum, Commodore 64 and Amstrad CPC platforms. 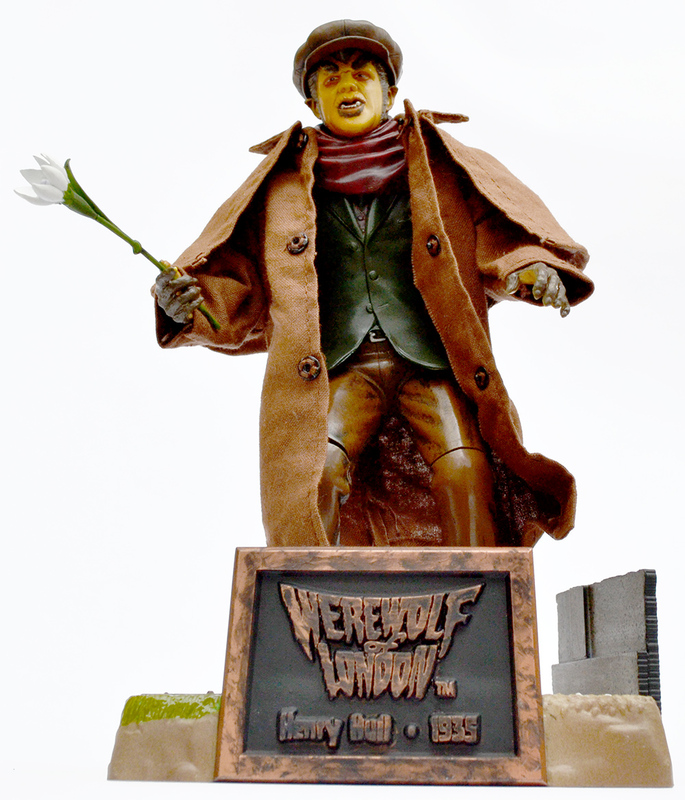 But the film’s most lasting legacy must be as the inspiration for John Landis’ An American Werewolf in London, which became a major hit when released in 1981. 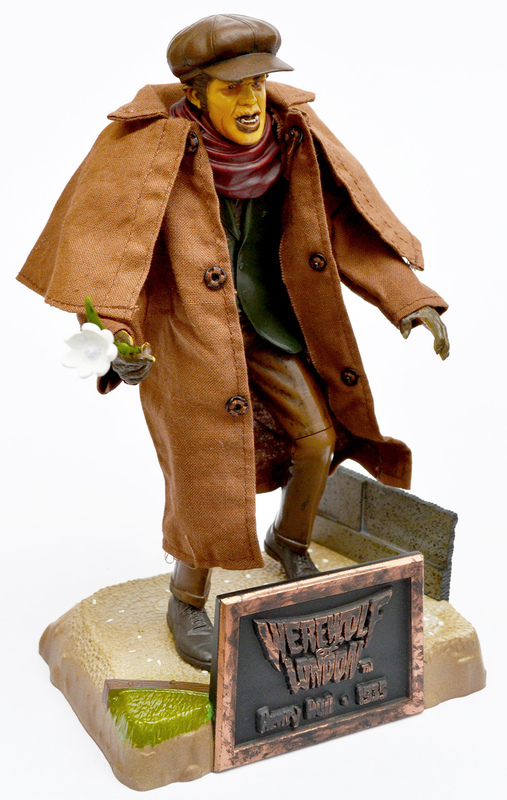 This Werewolf of London action figure was part of Universal Studios Monsters, a collection of 15 possible action figures released by Sideshow Toy that featured some of the studio’s most iconic movie monsters. 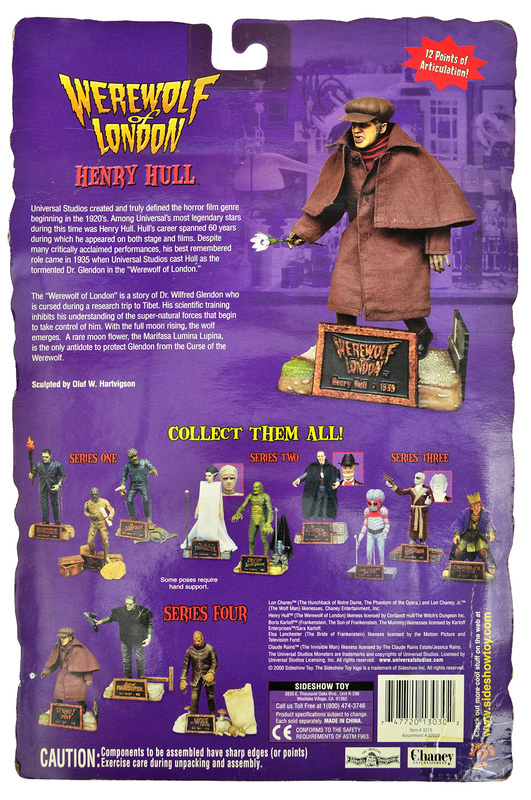 Werewolf of London was part of Series Four of the collection. The nameplate on the base featured the film’s legend. The painted figure measured eight inches tall (when placed on its base) and featured 12 points of articulation. It shipped in a cardboard-backed blister pack, the back of which featured a short synopsis of the film and showcased the other figures from the collection available at that time. 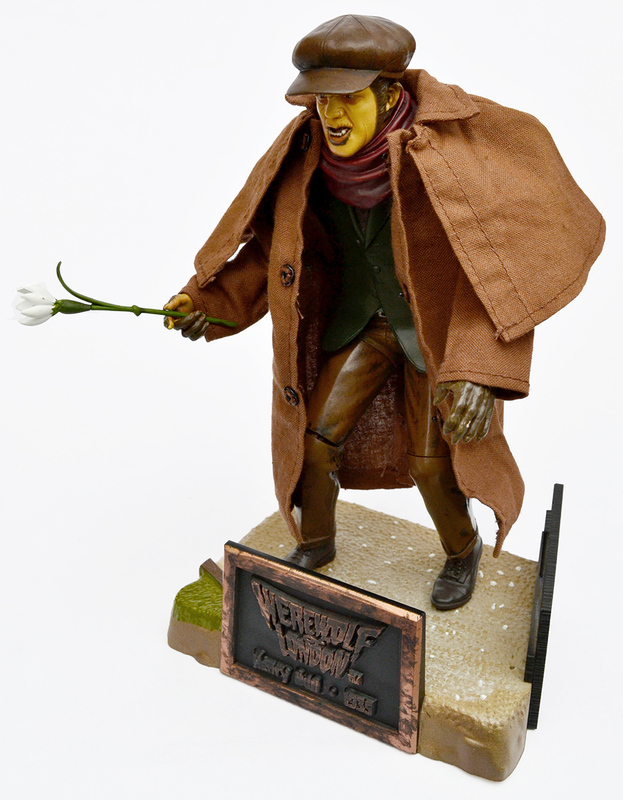 Werewolf of London shipped with four accessories: a fabric coat; a hat; a moulded plastic scarf (which wasn’t the easiest thing to attach) and a single Marifasa flower. 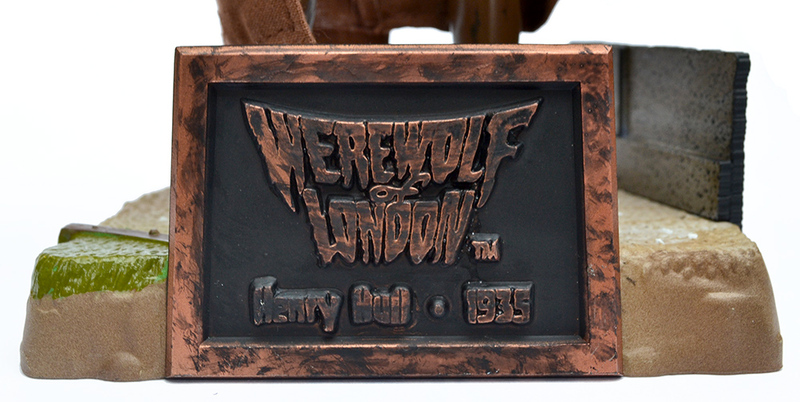 Also included was a base and nameplate that featured the film’s legend. Werewolf of London, from all sides. 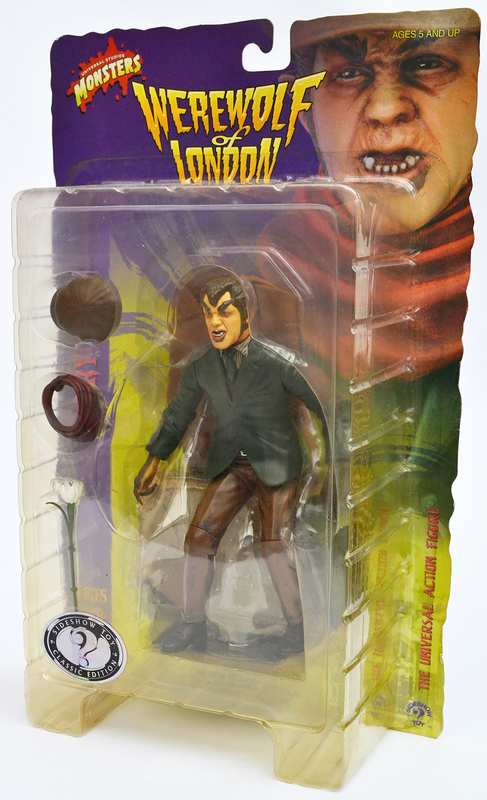 It’ll come as little surprise to discover that, due to its age, this Werewolf of London action figure is now well out-of-stock. Copies can still be found on ebay, but it isn’t the easiest to find and a BNIB edition could set you back anywhere between £30-£50 ($40-$70). 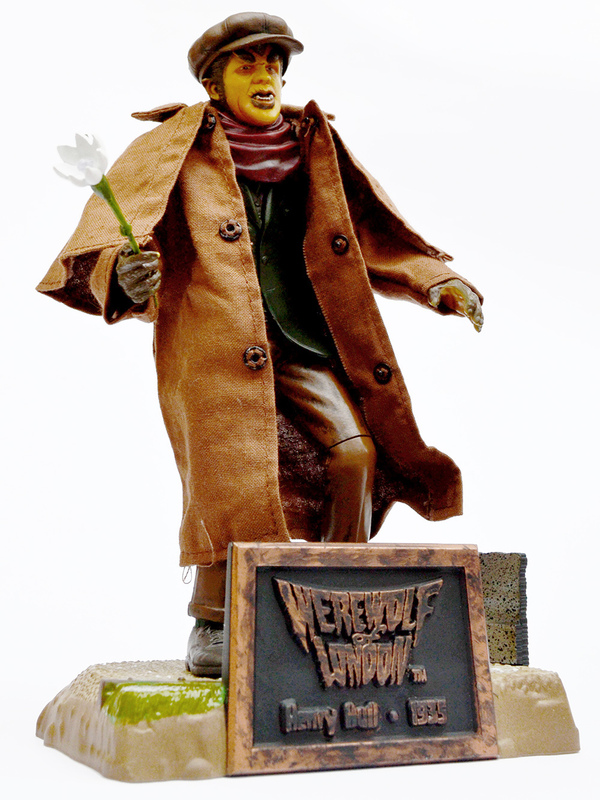 As a result this action figure will probably appeal more to die-hard Werewolf of London fans as opposed to the casual action figure collector. It does look good on the shelf though. Next: The Metaluna Mutant from This Island Earth.